Conservatories and Orangeries should, where the budget permits, be bespoke and individually designed to meet your requirements in terms of size, shape, specification and colour. Conservatories are however, classified into a number of particular styles which is for the most part determined by the structure of the roof. 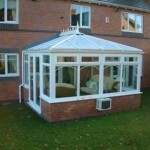 Although ultimately, the designs of conservatories and orangeries are limited only by your imagination and the technical requirements of roof construction, there are a number of specific design groups which conservatories fall into. 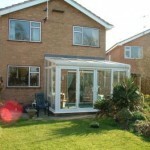 Sun Lounge conservatories generally have a single pitched lean-to style roof and are sometimes referred to as Lean-To conservatories or a Garden Room, Sun Lounge conservatories are the simplest of all conservatory designs and generally have a single pitched roof with angled side frames. Normally square or rectangular in shape, the Sun Lounge Conservatories are generally the most economical of conservatories in terms of build cost though most customers prefer something less plain. With a hipped roof, the stylish curved front of Victorian conservatories is normally built with 3 or 5 sections offering panoramic views of your garden. The more sections or facets the bay has, the smoother the front curve of the bay. 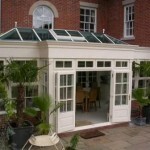 However, although the style of the curved bay adds character to Victorian conservatories, consideration must be given to the positioning of the doors and furniture due to the loss of space caused by the bay, especially in small conservatories. 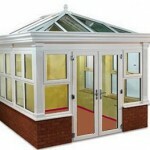 Edwardian conservatories are sometimes referred to as Georgian conservatories. With a hipped roof and being a square or rectangular in shape they combine the shape and practicality of a Sun-Lounge with the roof style of Victorian conservatories. There are two styles to these conservatory roofs, Georgian – with the roof spars fanned out from the finial to the eaves and Edwardian – a more traditional hipped roof version. With the same rectangular floor space as Edwardian conservatories but without the hipped roof, gable conservatories have a continuous ridge from the house wall to the front of the conservatory wall. This forms a high, angled glazed front wall section which creates a greater sense of space. This in turn helps to keep your internal room brighter by allowing light to stream in from the high front windows – ideal in north facing conservatories where the internal room would otherwise be dark. Most conservatory designs can be combined with others to form structures such as ‘P Shape’ or ‘T Shape’ conservatories by incorporating hips and valleys into the roof. This style is ideal for larger homes where conservatories could be built across the rear of the property with one area providing a dining room, the other a second lounge, for example. Often it works well to install a single door to provide side access and front double doors, patio doors or bi-fold doors to provide access to the garden. Orangeries provide the ultimate in luxury home extensions with period features such as stone or brick pillars, sculptured pilasters, a deep ornate external fascia and deep internal skirting boards. The external fascia hides an internal plaster boarded flat roof section which is ideal for installing chrome or brass down lights to illuminate your Orangery during the evening. Modern technology compliments these traditional features by providing water tight flat roof areas and engineered roof systems. Not surprisingly a new style of conservatory has recently entered the market which maintains the ease of construction of conventional conservatories but which attempts to replicate some of the features of an Orangery. Based on the Edwardian conservatories, they have a deep aluminium gutter and fascia cladding system which conceals the ends of the glazing bars, and an internal Orangery style soffit or pelmet. This gives the appearance of a traditionally built Orangery without the need for expensive parapet walls, flat roof sections and complex lantern roof structures. The style of conservatory which homeowners eventually decide on is ultimately down personal choice but conservatories really ought to suit the host house and garden in terms of style and size. And it also needs to suit your budget. 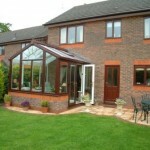 We take the view that conservatories should at least look as though it was built at the same time as the host property. In that way, conservatories should appear to be a credible part of the overall design of the house, whilst also being in harmony with the garden. There are a number of conservatory roof companies which manufacture well engineered and well-designed conservatory roofs but at Just a Quote we tend to recommend just a handful of them. 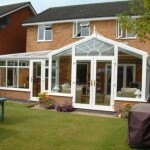 Our installation companies will go into much more detail during a survey but you can guarantee that all of the companies we recommend will have taken into consideration that in the United Kingdom, most conservatories during their first ten years will have had to cope with almost 30 feet of rainwater, 200 days of snow, and 3,650 days of temperatures ranging from 10º or 15º below freezing to, well at least sometimes, a hotter than average 35º. At Just a Quote our installation companies’ conservatory designers also take into account the aspect of the conservatory, as north facing conservatories may need more insulation and south facing conservatories more ventilation. 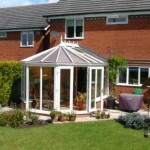 Additional protection from conservatories overheating can be designed in with the correct type of conservatory glazing, by recommending heat reflective polycarbonate or anti-sun glass in the roof. Our intention is to ensure that all conservatories and orangeries are designed to be usable throughout the whole of the year.